Contruction Date: site established 1952; construction Aug 1978; dedicated Juen 23, 1979. Sources: File materials from Botanic Garden library. JGarden Description: The Shofu-en (lit. 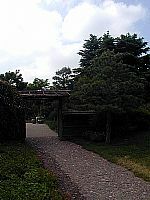 'garden of the pine wind') is a two-acre garden designed by Kawana Koichi and dedicated in August 1978. The core features of the garden are the specimen pines, collected and donated to the garden by the Denver Bonsai Club (some of whom later formed the Rocky Mountain Bonsai Society), and the large boulders, collected from the nearby Rocky Mountains. The skeleton of the garden was built around 800 tons of rock chosen from the mountains near Golden and Loveland. They were placed to represent mountains and cliffs by the sea. The 125 ponderosa pines (Pinus ponderosa), also from the region, form the next layer of the design. Large swaths of green turf are interrupted by deciduous trees and shrubs, usch as cutleaf weeping birch (Betula pendula; maples (Acer rubrum and A. Ginnala); redleaf Japanese barberry (Berberis thumbergi); flowering cherry (Pyrus calleryana); bugle weed (Ajuga reptans); multi-colored Iris ensata (growing along the stream); and several varieties of thyme (Anarcharis provide seasonal color and interest. The garden is patterned on the chisen-kaiyushiki template (lit. pond and stroll garden). A walking path meanders through the garden around a central pond with several points of interest interrupting the walk. Three small islands in the pond represent the usual crane (the largest), tortoise and treasure ship, symbols found in many gardens of this type. There are five stone lanterns, each of them emphasizing a specific view. The largest and most significant is a yukimi-doro or 'snow-viewing lantern' located near the pond and donated by Denver's sister city, Takayama-shi as a symbol of goodwill and friendship. A second Katsuga style lantern was donated by Takayama in 1964 and was 200 years old at the time. The other lanterns are on the eastern pathway, at the tea house and near the wisteria arbor (an oribe-doro). A wisteria arbor (two vines, white and lavender, donated by Takayama in fall 1981) is located in the nortwest corner of the garden. It was placed here as a stopping point along the path. A square-shaped kesagata water basin is also located nearby. It is a replica of the water basin at Ginkakuji, in Kyoto. A tea house is located in the opposite, northeast corner. It was built by the Kumo Construction Company from Nagano-ken, Japan. The building was built in Japan, disassembled, numbered, shipped and reassembled in Denver. Hirabayashi Toshitame, President of the company, and eight Japanese co-workers built the structure in about two weeks. The cost of the teahouse was covered by a grant from the Weckbaugh Trusts. The slope of the roof mirrors the sweep of the pine branches and the parallel lines were apparently indended to emphasize the other straight lines of fences, walls and hedges. A second water basin is arranged as a tsukubai near the tea house to provide the ritual hand rinsing prior to the tea ceremony. A final features is a taikobashi or drum bridge near a section of the pond. The garden is screened from the other parts of the botanic garden by scrims of bamboo fencing on the north, west and east sides. The garden has two entrances and the scenes unfold quite differently depending on which direction one takes. The full botanic garden is quite extensive, covering a 22 acre site. It includes a conservatory, greenhouse, visitor's center, gift shop, restaurant, reception area and meetings room. The garden does host weddings and conferences. Other gardens include: rose, herb, rock, xeriscape, high plains, alpine, and lilacs.